To access the domaine, one has to pass Beaunes-de-Venise and begin the accent to the small town of Suzette. A small road to the left is not marked, but will twist over small hills until finally, up the left about a mile away, the house becomes visible. A long gentle slope is lined with vines. The Dentelles de Montmirail tower above the winery. 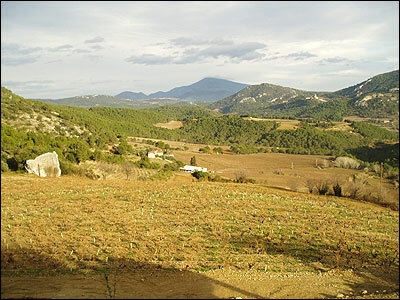 The area is isolated, with warm breezes and the scent of the garrigue (rosemary, thyme, sage) in the air. Shortly after the purpose, the Cheron made some important investments to improve the grape varieties and to construct a winemaking cellar. 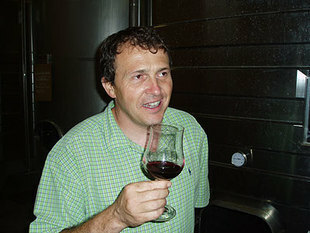 In the early 1980s, Denis' son Yves, a graduate in enological studies in Beaune, took over the labors at the domaine. He refurbished an old convent on the property and made it his family house, an amazing home overlooking the vineyards and with a killer view of Mount Ventoux in the distance. The domaine covers more than 35 hectares planted exclusively on the hillsides and terraces, known locally as banquettes. 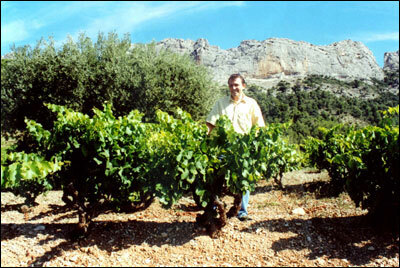 The vineyards are situated directly on the southern slope of the famous range Dentelles de Montmirail. It is a superb site, dominated by granite cliffs nearly a hundred meters in height. 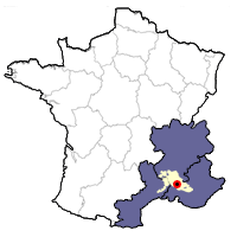 Grand Montmirail is in the extreme southeastern part of the appellation where the soil is very complex. In this map, the two white areas on the right represent the two ridges of the Dentelles (literally lace, as the ridges of the rocks resemble lace on the cuff of an old-fashioned blouse.) The town of Gigondas is about three kilometers as the bird flies over the Dentelles, a route which is unaccesible by car. Instead one has to circumnavigate the range, and pass through Beaumes de Venise, Vacqueyras and finally Gigondas, a journey some fifteen minutes long. The vines benefit from a remarkably sunny exposure while being sheltered from the winter mistral by a sort of natural amphitheater. The altitude of the vineyards varies between 300 and 350 meters— among the highest in Gigondas, something that helps the wine retain some acidity. The subsoils of their parcels are composed of sedimentary clay from when the sea covered this site. The rise of the Alps created many rifts, including the emergence of the impressive rocky barriers that are the Dentelles. But this clay is littered with small pieces of limestone, and it is the combination of these two soils that help give Grand Montmirail its round, approachable texture. Although the soil is well-drained, three springs run under the property so drought is rarely a problem. This also helps give the wines an extraordinary elegance that much of the appellation finds difficult to obtain. Gigondas Les Deux Juliette Vieilles Vignes: This cuvée is named after the daughters of the producer (Yves Chéron) and the importer (Charles Neal), both of whom have girls named Juliette. The blend is 80% Grenache from 55 to 65-year-old vines, 15% Syrah and 5% Mourvèdre from 30-year-old vines. The yield is just over two tons (33 hl /ha) an acre and all the fruit is harvested manually. The emits explosive aromas of kirsch, stone fruits, licorice, pepper, suave baking spices and a slightly floral character, perhaps violets. It has a supple texture that shows plenty of elegance, and a wonderfully long and satisfying finish. Vacqueyras Le Soleil de Rosalie: Domaine du Grand Montmirail also owns vineyards in Vacqueyras, just as one leaves the town heading southwest. The wine is vinified in much the same way as the Gigondas, using about 65% Grenache, 25% Syrah and 10% Mourvèdre. Replete with fruit and absent of the rusticity often associated with Vacqueyras, the offers a delicious mouthful of wine, with notes of berries, spice and a finishing note of licorice. 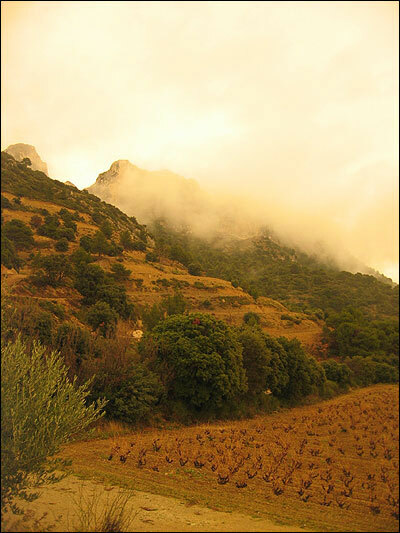 Beaumes de Venise: Their Muscat à Petits Grains comes from hillside vines planted on the opposite side of the road toward Suzette. The grapes are harvested by hand and fermentation begins with their indigenous yeasts. When the grapes hit about 9% alcohol, their fermentation is muted with the addition of neutral alcohol, which prevents the yeasts from working. The result is a delightful sweet wine whose aromas include tropical fruit (pineapple, guava), stone fruits (pear and peach), along with a touch of orange. Unlike some sweet wines from the appellation, this version remains light on its feet and is perfect as an aperitif or to accompany fruit-based deserts. The harvest begins with Syrah, the quickest grape to ripen, and then the Grenache in the highest spots. The Mourvèdre is the slowest ripening and usually the last grape to be harvested. The entire harvest is picked by hand: Yields are never more than 35 hectolitres per hectare. 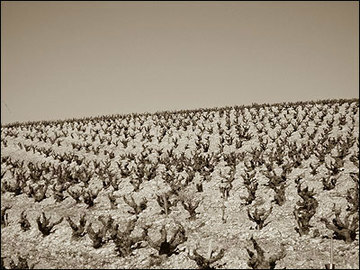 Among the old vines on the terraces, it generally falls to 30 hl/ha at most. The recently-picked grapes are transported quickly to the winery situated off to the side of the vineyards. After being completely de-stemmed, they go into the tanks and are lightly crushed. The tanks themselves are made of cement and are temperature-controlled. The must is cooled and the pre-fermentation period lasts several days in order to extract pigment and primary aromas of the grape. Then the fermentation begins. Only indigenous yeasts are used. Fermentation generally lasts between 10 and 12 days. The pressing takes place in a bladder press. Aging occurs in enamel-lined tanks in the temperature-controlled winery. The vats themselves are completely underground so they naturally remain cool. No oak is used during the wine’s élévage. Malolactic fermentation normally takes place by the end of the year. The wine is then racked four or five times before bottling. The addition of sulfur is kept to a minimum. Filtration is extremely light.